An admission. There was a ripple of excitement at Crafty Towers when we first heard the name of Moon Dog's latest limited release. Knowing that, for all the silliness, there are some sharp and broad minds at the Abbotsford brewery, we figured it might be a reference to Yossarian's buddy from the novel Catch-22. Not only is Joseph Heller's masterpiece revered at Crafty Towers, but Dunbar is involved in an exchange that a much younger Crafty thought captured the very meaning of life. But it's not that Dunbar. However, the story behind the beer is no less charming. 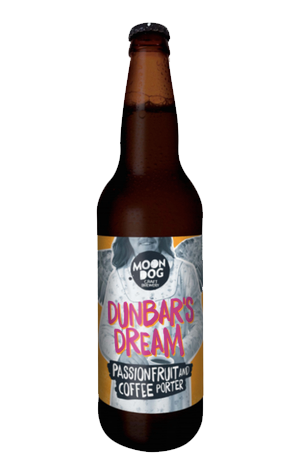 Dunbar is a friend of Moon Dog's head of experimental brewing, Adrian McNulty. One night, that Dunbar had a vivid dream. And in that dream was a passionfruit and coffee porter. Thus, like a beer world rendition of Matthew Kelly, Adrian set out to make Dunbar's dream a reality in the shape of this passionfruit and coffee Baltic porter. It's big (9.2 percent ABV), fulsome, dark and smooth, as a Baltic porter should be, with the coffee from Coffee Supreme added in both French press and espresso form at different stages and passionfruit dropped in three-quarters of the way through fermentation. The coffee acts more as a complementary aside to the dark chocolate malt characters with the passionfruit much more to the fore. Interestingly, it comes across as a red berry fruitiness as much as passionfruit, creating a luscious beer akin to a fruit crème-filled after dinner chocolate.